PETALING JAYA: Axis Real Estate Investment Trust (REIT) will soon lose Nestle (M) Bhd as an anchor tenant in one of its properties but it is in discussions with prospective tenants. Before it leases out the office space, Axis REIT will renovate the property, long known as Nestle House, in Petaling Jaya to draw new tenants. Axis REIT Managers Bhd chief executive officer Stewart LaBrooy said the group would embark on a major refurbishment called “The remaking of an Icon”. “We will be spending RM7mil to renovate and reposition the building as a 21st century icon. Renovations are targeted to be co-meted by January next year. We expect the building to be ready by 2010,” he told StarBiz. He said changes to the exterior, interior and mechanical and electrical systems were planned. Nestle is said to be moving out from its headquarters, Nestle House, in October to Surian Tower in Mutiara Damansara. LaBrooy said Axis REIT purchased Nestle House for its iconic status and location and was one of its best buys for the trust. “It has one of the best locations in Petaling Jaya and our acquisition price of RM375 per sq ft was a bargain by all counts,” he said, adding that to date, the building had generated a lot of interest in the market. “We are actively speaking to many potential tenants. The impact to the trust will be a building with better returns in the long term once the makeover is completed,” LaBrooy said. While he remained unperturbed by Nestle’s moving, he did not disclose if the move would affect the trust. “Our strength lies in our diverse portfolio of 19 properties as it spreads risk over a much larger base,” he said. LaBrooy said the company was always looking for high-yielding acquisitions that would benefit the trust. “We have a substantial pipeline of properties in place,” he added. Axis REIT’s occupancy as at March 31, rose to 95.4%, up from 95.2% as of Dec 31, 2008, with a few vacancies in its office properties. LaBrooy said the company had positive rent reversions in the first quarter of this year. He said the rates were extremely competitive vis-a-vis the current markets and well below the rates charged in KL. “As a result, we are getting enquiries from companies wanting to move out of KL to Petaling Jaya to reduce costs or avoid traffic woes,” he added. For the first quarter ended March 31, Axis REIT posted a net profit of RM10.4mil, up 15.4% from RM9mil in the previous corresponding period. Revenue for the period rose to RM17.3mil from RM14.5mil a year ago. It reported earnings per share of 4.07 sen versus 3.76 sen a year ago. KULAI (Johor): Main-board listed Scientex Bhd will continue to focus on the affordable housing segment to expand its property business in Johor. It will offer a wider range of affordable houses and commercial properties to cater to demand, said Scientex Berhad managing director Lim Peng Jin on May 15. "Various development plans are in the pipeline and will be executed at the right time. Meanwhile, the housing industry should continue to benefit from the improving domestic economy, low interest rate regime, stable labour market and favourable stock market sentiment," he said in a statement. The group is launching its double-storey terraced houses called Casuarina Classic in Scientex Kulai on May 17. Of the 187 units of the Casuarina Classic, 40% had been sold in two weeks of its opening sales date, and 100 units sold within three weeks. The units cost RM89,800 for Bumiputeras and RM92,800 for non-Bumiputeras. It introduced the 16'x 60' affordable homes earlier at its township development in Pasir Gudang and is now offering the same model of houses in Kulai following the popularity of the homes in Scientex Pasir Gudang. Covering 1,100 acres, this integrated self-contained township will comprise 12,000 residential and 520 commercial and industrial developments when completed. To date, more than 5,000 residential, 143 commercial and 84 industrial developments have been completed and occupied. Scientex Kulai is an integrated township being developed in Sedenak, Kulai Jaya over a 250-acre site. Around 4,000 units of residential and commercial properties will be developed on the site in the Secondary Promotion Area of Iskandar Malaysia. The first phase of Scientex Kulai called the Casuarina was launched in April 2008. Consisting 211 units of double-storey houses, 65% has been sold to date. Scientex Kulai's upcoming phase, Lavender, will feature a guarded community comprising 94 units of double-storey semi-detached houses which will be launched in June. "We have consistently delivered our properties to buyers on schedule without compromising on quality," said Lim. "Looking back at our past projects, we have proven our capability to deliver vacant possession to buyers before completion date whilst maintaining good standards in terms of speed, cost and quality," he added. Scientex has a market capitalisation of more than RM250 million and about RM600 million in assets. For the year 2008, Scientex’s revenue exceeded RM600 million. In addition to its property division, Scientex’s manufacturing operations comprise two business units - packaging and polymer. It is the world's largest producer of stretch film, with an annual product capacity exceeding 10 billion metres. KUALA LUMPUR: The Asia Pacific real estate investment market continues to contract further in the face of global financial turmoil, says Colliers International. In the quarterly update of the Asia Pacific real estate investment market, it reported total value of investment sales transactions in Greater China fell by 67% and South Asia plunged 84% in 1Q 2009 compared with 3Q 2008. The value of sales transactions in the region's industrial property market sales saw the most severe contraction, dropping 84% between 3Q 2008 and 1Q 2009. Colliers said the real estate market environment will continue to be challenging throughout 2009 due to uncertain occupational demand, selective lending by banks and bid-offer spread remaining wide,. Piers Brunner, Colliers International Asia chief operating officer however expects the market to improve when banks gradually strengthen their capital structure and become more proactive in offering loans to the real estate sector. "Therefore, the region's real estate investment yields in the coming quarters of 2009 are expected to edge upwards but at a slower pace than in 4Q 2008 and 1Q 2009. Given the projection that economic recovery may be in sight in 2010, it is now the time for investors to identify their targets, take advantage of current price weakness and act before the market takes off again," said Brunner. Institutions and real estate investment funds, the typical buyer group for sizeable developments, have been sitting on the sidelines, or biding their time for better market entry points over the coming months. A majority of real estate buyers have held back from entering the market, hindered by the difficulties of obtaining sufficient financing from banks in the private sector. Simon Loh, Colliers Director of Research & Advisory said: "Despite a general reduction in interest rates in 1Q 2009, risk premiums expanded as investors perceived a rise in liquidity risk and anticipated a further consolidation of the global economy. As such, real estate investment yields softened further by 25-75 basis points (bps) in 1Q 2009." Despite a strong recovery of local stock market prices, the yield in the overall investment sentiment in Hong Kong remained cautious in 1Q 2009, with the bid-offer spread remaining wide. As explained by Antonio Wu, Regional Director, Asia Investment Sales, and Head of Hong Kong Investment & Retail Services, the yield spread between real estate investment yields and banks' lending rates continues to expand as investors have factored in a thick risk premium in their bids. There is, however, a degree of optimism as the availability of bank financing is expected to improve as local banks have become more active in offering financing packages recently. “With prices coming off 45% from the peak, prime offices in the CBD look attractive to long-term investors. Retail properties in prime locations are also expected to draw investors' attention considering the buoyant retail sales of Hong Kong which is underpinned by visitors, especially those coming from mainland China," says Wu. Lina Wong, Colliers East and Southwest China managing director, said the relaxation of investment regulations and the lowering of equity ratios for development projects act as positive stimulation to the real estate market in China. She added Shanghai's residential, CBD office and retail property markets are perceived as opportunities for investment as they are supported by resilient end-users' demand, sustained demand by MNCs and sustained growth of retail sales respectively. Singapore which is experiencing declining property prices and slower investment activity recorded a total investments sales value of S$242.25 million (US$166 million) in 1Q 2009. The amount is only 1.9% of the $12.69 billion investment sales during the peak period of the market in 3Q 2007. "Looking ahead, commercial and office buildings in Singapore are worthwhile for investors especially those in the CBD where prices are falling to a realistic level," said Dennis Yeo, Colliers International Singapore managing director. Dubai’s property market will recover in 2011 after a price drop this year, Deyaar Development PJSC’s chief executive officer said. Dubai house prices tumbled 41 per cent in the first quarter from December, Colliers International said in an April 28 report. 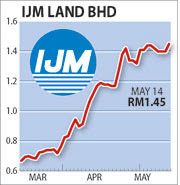 AMRESEARCH Sdn Bhd is maintaining a "buy" rating on IJM Land Bhd, the property arm of IJM Corp Bhd, with a RM2.40 fair value, following good response to the launch of its "Summer Place" condominium project in Penang recently. The local research firm said it was surprised by the stronger-than-expected market response to the developer's recent soft launch of Summer Place, which had on offer 528 condominium units at RM330 per sq ft. The take-up rate has now reached 75 per cent, within a month of launch. This has prompted IJM Land to bring forward its maiden debut of "The Light", which is located close to Summer Place, starting with the launch of "The Light Linear" in June, said AmResearch in a report yesterday. The Light Linear project will offer 328 condominium units with build-up ranging from 1,379 sq ft to 1,520 sq ft and are likely to be priced around RM400 per sq ft.
"Some 1,500 potential buyers have registered with IJM Land to purchase The Light Linear - further underpinning our conviction on demand. The management may also be looking to extend its "My Space" homeownership programme with possibly early birds discount to boost buying interests," said AmResearch. The second phase of The Light development will be "The Light Point", comprising 88 units of luxurious condominiums with build-up of between 1,800 sq ft to 2,250 sq ft in a 28-storey block. It will be launched in September 2009. The units will be priced around RM500 per sq ft.
AmResearch said it reaffirms its conviction that IJM Land is an excellent reflation stock play, given that it is still under-researched and under-owned by the investment community. "Its institutional shareholdings are also low, as such it can leverage on parent IJM's wide following among institutional investors to build a solid shareholding structure, and it has attributes of a large cap blue-chip proxy to the property sector," it added.